Recently the industry group Infrastructure Partnerships Australia made a proposal to ‘fix Australia’s social housing system’. State Governments, said IPA, should sell off their public housing properties over a twenty year period, and place the proceeds in ‘Social Housing Future Funds’. Income from fund investments (reckoned by IPA at the rate of the CPI + 4.5 per cent) could then be used to pay community housing providers to deliver housing services to eligible persons. Unsustainable public funding – a raw lack of available dollars to spend – is the principal problem facing Australia’s social housing system. And IPA’s solution of investment-generated funding – and particularly the prospect, highlighted by IPA, of it replacing all Australian Government funding for social housing within 10 years – will be beguiling to some in government. But this way of thinking about social housing’s ‘principal problem’ – a ‘raw lack of dollars’ – misconceives of the potential of public funding, and even of the nature of money itself. If we rethink the conventional wisdom about money and about government spending, we’ll find that there’s a much more straightforward and sound way of addressing unmet housing needs: governments – particularly the Australian Government – should spend money to get more and better social housing. In their chapter in the new edited collection by Michael Jacobs and Mariana Mazzucato, Rethinking Capitalism, Randy Wray and Yeva Nersisyan summarise the rethinking about money that has taken place in recent years under the banner of modern monetary theory, what it reveals of the way money actually works, and its implications for policy. Below we’ll illustrate Wray and Nersisyan’s general explanation of modern money with some Australia-specific examples. Money, in this view, is an amazing social technology: a system of universally transferrable credit. It allows person A to contract for goods and services from person B, who in return gets a credit from A, and for B to use this credit to receive other goods or services from C, all according to a common unit of value and in a systematic accounting of individuals’ credits and debts. We all participate in this social technology, and the national government has a crucial role in making it work. Where A pays B for goods and services, the dollars that B receives will come from a deposit in A’s favour at their bank. This deposit is the result of the bank making a loan to A, or of A receiving a payment from some other person (C, D, etc) who got a loan from a bank. Whatever the trail of transactions, the starting point is the same: money is loaned into existence by a bank. A creditworthy person applies for a loan, gives the bank a promise that they will pay the money back with interest, and the bank creates the money out of nothing more than the keystrokes of a clerk working in its electronic books. There it stands as a deposit in the person’s favour – and hence a liability of the bank. With this money to their name, the person can direct the bank to dispose of it in transactions with other persons, making corresponding credits and debits to their respective accounts, including accounts at other banks. This is done through the payments system maintained by an instrument of the Australian Government, the Reserve Bank. At the Reserve Bank, banks themselves have accounts – ‘exchange settlement accounts‘ – which are used to settle the balance of liabilities between banks arising from all those transactions they’re involved in everyday. The dollars in the exchange settlement accounts are keystroked into existence by the RBA (in return for bank assets – bonds and other creditable promises to pay). Should a bank need more of these reserve dollars in order to settle its liabilities at the end of the day, it can borrow them from another bank with reserves to spare (in return for a promise to pay back with interest) or it can apply for more from the RBA’s standing facilities (which, again, keystrokes them into existence, in return for bonds and other creditable promises to pay). Should a bank in need of reserves not be able to convince another bank or the RBA to advance them, the bank goes out of business, and persons with deposits may lose their money (in which case, they may make a claim under the Australian Government’s deposit guarantee, which will keystroke up some replacement dollars). 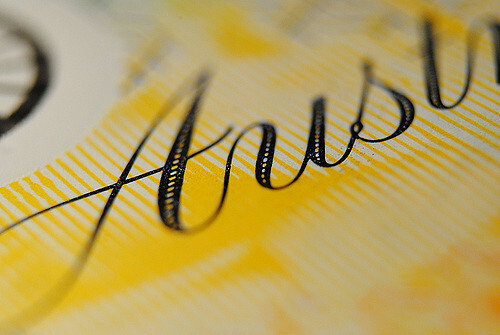 The lending of reserves between banks is of utmost concern to the RBA: it is the interest rate on these loans (the ‘cash rate’, or ‘overnight money market rate’) that the RBA discusses and makes announcements about every month, and it tries to get the rate it wants by working on the supply of surplus reserve dollars. It does so by transacting with banks (‘open market operations‘): if it wants the interest rate to go down, the RBA pays out additional dollars (more keystrokes) in return for bank assets; if it wants the interest rate to go up, it draws in dollars (by selling assets). In another support to interest rate policy, the RBA pays interest to banks with unlent surplus reserves, at a little below the target rate. Again, those interest dollars are keystroked into existence by the RBA. As well as operating the payments system and interest rate policy, the RBA is also the Australian Government’s bank, where it has accounts for transacting with individuals and other entities. To make a payment to a person, the RBA keystrokes a credit to the reserve accounts of their bank (with corresponding credit to stand in the person’s own account with their bank), and to receive payments from a person (for taxes, bonds, fines, etc) it debits the reserve account of the bank where the person had arranged for the payment money to stand as a deposit. The Australian Government can never lack Australian dollars. It issues the national currency through which the national payment system works. Private sector entities – persons, businesses, banks – may experience a ‘raw lack of dollars’, if no-one will transact with them or they cannot get loans (because they cannot make convincing promises to repay). It also goes for state and territory governments, which use, not issue, the national currency. But not the Australian Government. There is a strain of conventional wisdom that holds that the Government can run out of money, as if there’s a finite amount of it like gold or silver. But gold and silver aren’t money. The Australian Government can no more run out of money than it can run out of keystrokes. Although it cannot run out of money, the Australian Government doesn’t set the amount of money in the system. Instead, that’s determined by the demand for it by everyone who uses it, and the credibility of the promises of private sector entities to pay the banks who lend it into existence that much and more in interest. The conventional wisdom worries about the potential for governments to ‘print money’ and upset its proper supply, causing inflation. But really, the supply of money depends on the demand for deposits, which may be susceptible to interest rates (ie both the bank and its customer will be thinking: can they really promise to pay back at this rate of interest?). That’s why the Reserve Bank pursues a cash rate target, and in doing engages in open market operations or reserve interest payments that essentially involve printing money. It is not the stock of money, but the spending of it, that it important to prices. Because it can never lack money, the Australian Government’s ability to spend money is not constrained by tax or bond issue receipts. It does not need to tax or borrow before it can spend; if anything, government spending (payments in the reserve accounts of banks) has to come first, in order for private sector entities to get the money that they will use to pay taxes or buy bonds. Nor does government spending necessarily have to be matched by taxes and bond receipts (ie ‘balancing the budget’) over a given period: indeed, government deficits are necessary if the private sector wants both to save some of its income, and maintain its production of goods and services. Taxes knock out some of the purchasing power private sector entities have, and so clears some space for the Australian Government to spend on goods and services without undue inflation. The tax burden can be distributed differently over the population, in the name of fairness; and activities may be taxed differently, to shape behaviour. Bonds are important for private sector entities, as a secure savings vehicle that yields a stream of income dollars and be pledged for loans, more than for the Government. The Australian Government’s spending is constrained not by finances, but by the economy’s real resources. If the Government spends on goods and services that are in short supply, it will tend to bid up their price. Whether the availability of these resources can be increased will depend on the productive capacity of the economy: whether there’s unemployed labour or unused equipment that can be drawn into use; whether there is otherwise engaged labour and equipment that can substitute – at the expense of the uses to which they are currently engaged. This is, in part, a technical question of capacities; it is also a political question of the ends to which resources are put. We can question whether the purposes pursued by the Government when it spends are really worthwhile ones, and whether the way the resources are being used gets the best and most out of them – and we can pose the same questions about the purposes and results of private sector spending. But the Australian Government can always ‘afford it’ in a financial sense – it can buy anything that is for sale in Australian dollars, and meet any liability denominated in Australian dollars. So, the Government can always afford to spend money in the form of social security payments to non-workers that enable them to buy a share of the goods and services produced by others (the real question is about the fairness of the redistribution of purchasing power over the goods and services). It can also afford to spend money in wages to engage otherwise unemployed labour in the production of goods and services that the private sector isn’t spending on. And if it determines that the overall public good is served by committing resources to particular ends – building, say, a submarine factory, or a social housing estate – the Australian Government can always afford to pay private sector entities for the resources necessary to achieve it. The IPA paper actually does a very good job of stating some ‘first principles of social housing’, the very first of which is ‘housing should be provided to those who cannot provide it for themselves’. It is proper to meet this principle in a straightforward way: by spending government money – ‘social money’ – to purchase the resources – the land, the bricks, the tins of paint, the labour of tradespersons and tenancy managers – needed to make it happen. We don’t need to liquidate resources already in government hands; nor do we need to promise to send a stream of dollars (fees and interest) to private sector finance institutions for the use of their money. The real problem is not a lack of dollars, but a lack within government of a sense of its real role and power in relation to money, and perhaps a lack of political will. In a second post we’ll consider the respective roles of the Australian Government, state governments and community housing providers in a social housing system informed and vitalised by modern money. While a government can create an infinite amount of money (which it can then spend), such action deflates the value of the currency and lowers credit ratings. Governments cannot create an infinite amount of capital, as you say: “Australian Government’s spending is constrained not by finances, but by the economy’s real resources.” Constraints exist. In practice, Australia’s governments could afford to spend much more on new housing. They would do so if it could be shown that the investment would return a greater financial return than investing elsewhere.